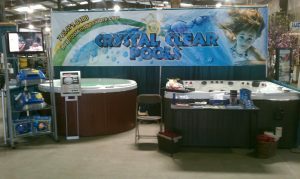 Many of you already exhibit in local trade shows, flower & patio shows or home & garden shows. Whether you are a trade show expert or you are considering setting up a booth in your first show, use these tips to help you make the most of your event. You’ve invested the money. Now, let’s get a good ROI.. Return on Investment. 1. Plan Ahead: Research trade shows in & around your area by looking online and on your local chamber of commerce website. List them out to see which are the best fit. Contact the event coordinator. Get the dates & times for the event. 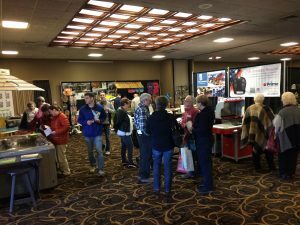 When can you set up your booth? How much does the event cost? What are the hours? Can you staff the event? I suggest planning your events at least 8 weeks in advance. 2. 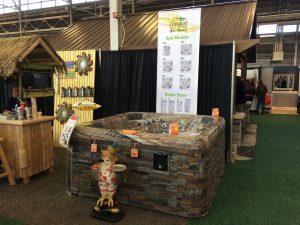 Choose The Right Show: Aside from the obvious shows; Flower & Patio – Home & Garden.. Find a Health Fair & promote the health benefits of swimming or hot water therapy with hot tubs. 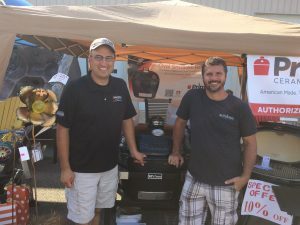 Get connected with a Builders Association in your city – Participate in any home & remodeling shows or get a few hot tubs on display in a Parade of Homes Spring Event. Sponsor local Swim Clubs or get connected with local high school swim teams. Get permission to set up a small booth and display info on water safety. Get permission to sell products like goggles or swimming gear. It’s all about creating relationships and name recognition. 3. Create Interest: Months before the event you should be posting on social media. If you are not on social media, I urge your to download my Beginners Guide To Social Media Success NOW. Get started ASAP. Your business success depends on it. Ask your employees to share your posts. Create an event on your business Facebook page. Invite everyone you know to the event. Post weekly leading up to the event to generate excitement. Consider raffling off something twice a day during the show. 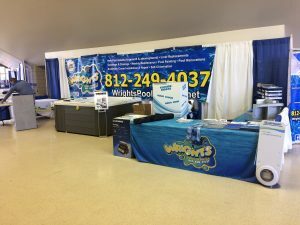 Give away a free opening or closing, a free pool float, a grill.. this will for sure generate excitement to come to your booth. Email your client base leading up to the show to inform them of the show, link to your Facebook event and your business page. What you don’t want to do is pay a small fortune to attend a show you aren’t going to promote hoping people walking buy will become solid leads. Make the effort to generate a profitable ROI (Return on Investment). Make special offers to customer that like your business pages and share your posts. Enter them in a drawing that will be picked during your show or event. Get on the phones inviting those special VIP Customers or informing any potential clients you’ve talked to in the last 6 months to come by to see your new products. Call anyone you’ve quoted jobs to in the last 6 months and offer them a discount if they sign the contract and make a deposit during the show. 4. Choose Focus Categories: Chemicals, Hot Tubs, Grills, Liner Replacements, Pool Installs.. Only your most profitable product categories should be displayed. Contact your distributor. I’m sure they would be willing to set you up with eye-catching displays and brochures for the show. 5. Show Display: Whether you buy a custom display or build one yourself – be sure your display is welcoming and functional at the same time. Don’t worry too much about chairs or stools. A trade show is not meant for sitting. Take lots of pictures of the show and your display. You will want to show off your event on social media and generate buzz. Show everyone your excitement. 6. Dress for Success: Anyone working the event should be in business casual attire with a company shirt. 7. Stand Up: Never sit behind a table. All the potential profits you planned on getting will walk right on by. Stand & be ready to say hello. Get out of your booth and let people walk in. Approach them after they have had a chance to look around. 8. Multimedia: Use video whenever possible. Set up a few flat screen TV’s with DVD players. Manufactures offer product videos on DVD or Flash drives. People are attracted to video. Press Play and set them on repeat. 9. Follow Up: Follow up with anyone that gave you their information. I prefer to set appointments right at the show for the week following the event. It’s best to get their contact info or business card and follow-up that night with an email or connect with them on LinkedIn. Follow up again with a phone call 1-2 days after the event to either confirm your upcoming appointment or to schedule an appointment. 10. Take Notes: Keep a folder of all past events. Your folder should have pictures of the event, pictures of booths you liked and pictures of your own display. Take notes on what worked and what didn’t. What would you do differently and what were the highlights. Refer back to your notes before beginning to plan your next event. Follow up with your staff to get their opinions of the show. And most importantly.. Calculate your ROI (Return on Investment). How many leads did you get from the show and how many sales were made from those leads. What was your close rate? Make improvements accordingly. What show event ideas have worked best for you? Please share your comments below. Join the conversation online on Facebook, Twitter, & LinkedIn. I look forward to responding to your comments and questions. What are you reading to grow your mind & your business? I highly recommend Extreme Ownership by Jocko Willink!